In Auvergne-Rhône-Alpes, there is no need for a time machine. Here, ancient remains, mediaeval fortresses, wonderful villages, UNESCO World Heritage Sites, Renaissance monuments and examples of Romanesque art offer visitors the chance to embark on a wonderful journey deep into the region’s past. 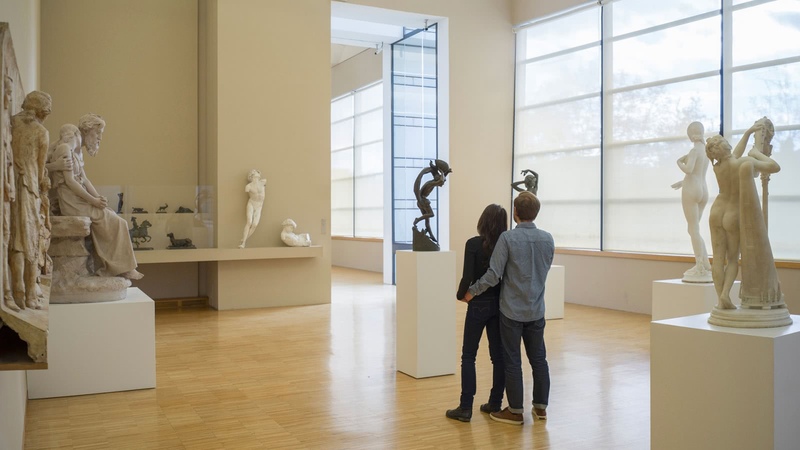 Contemporary art also lies at every turn, with avant-garde architecture, countless museums and the design city of Saint-Etienne. Don’t miss out on the many international festivals that showcase the unique culture of the Auvergne-Rhône-Alpes region, including the Jazz Festival in Vienne, the Contemporary Art Biennale in Lyon, the International Design Biennial in Saint-Etienne, the Chaise-Dieu and Ambronay festivals, as well as the international short film and street theatre festivals in Clermont-Ferrand and Aurillac and the Nuits Sonores in Lyon. Everyone is sure to find something in such a diverse cultural offering! Lyon, one of Europe’s great meeting points at the confluence of the Rhône and Saône rivers, is a key destination due to its architectural wealth and reputation for fine dining. The city is home to many areas of interest, including its historic centre with UNESCO World Heritage status, plus a wide variety of sites spanning 2000 years of civilisation, in stark contrast with the avant-garde features of a city undergoing far-reaching changes, as in the Confluence district, the source of much inspiration for leading figures in the world of architecture. The Musée des Confluences, the only one of its kind in Europe, combines knowledge from different branches of science in an effort to understand the history of humanity. Situated just 15 minutes from Lyon Saint-Exupéry International Airport and 30 minutes from Lyon city centre, “The Village”, a retail outlet for premium and luxury brands, welcomes visitors for an unforgettable and relaxing shopping experience. This exceptional environment with its elegant architecture is a veritable treasure trove of more than 90 luxury French and international brands such as Galeries Lafayette, Trussardi, Sonia Rykiel, Karl Lagerfeld, Baccarat and many more, complete with dedicated areas for children, restaurants and an artificial lake. Something for everyone! Lyon, world gastronomy capital, will be home to the Cité Internationale de la Gastronomie in September 2019. This unique facility will be a celebration of the delights of fine dining, good health, well-being and the art of living at the heart of Grand Hôtel-Dieu, currently being renovated. Visitors will be able to enjoy a 3900 m2 centre designed as an educational and interactive “journey of tastes”. A permanent exhibition will look back at the history of food around the world, of well-being and eating well. Temporary exhibitions will focus on specific products or a special guest country. Visits will be punctuated with sensorial experiences, with the chance to touch, taste and smell the products on offer. There will also be a demonstration area where professionals (chefs, pastry chefs, cheese producers, butchers, winegrowers, etc.) will present their skills to the wider public. This vast facility will also house an InterContinental Hotel(1), a convention centre, offices and housing, as well as restaurants, cafes and shops. 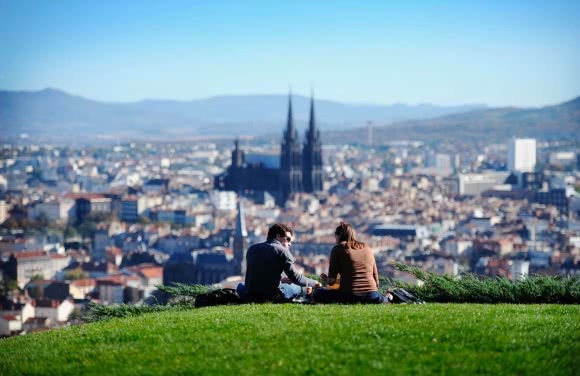 Auvergne’s historic capital nestled against the foothills of the volcanoes, gateway to the Chaîne des Puys and Limagne fault, metropolitan France’s first natural site to be awarded UNESCO World Heritage status. The history of Clermont-Ferrand can be traced back 2000 years and has an abundantly rich heritage to prove it. Its mediaeval and Renaissance architecture dazzles visitors in both the historic centre of Clermont and the centre of Montferrand. The Romanesque basilica of Notre-Dame-du-Port, a gem of Auvergnat Romanesque art, enjoys UNESCO World Heritage status as part of Saint James’s Way. The unique Gothic cathedral in anthracite lava stone dominates the city with its imposing form. The cultural season is particularly busy, with the Comédie de Clermont-Ferrand, which has “Scène Nationale” status, the Coopérative de Mai, one of Europe’s most renowned contemporary music halls, and Le Zénith, a hotspot for major cultural events. The city’s industrial past is revealed at L’Aventure Michelin, where the saga of the tyre manufacturer and its world-famous Michelin Man serve as a reminder that this brand was always one step ahead of its time. Rugby fans can soak up the history of the legendary ASM Clermont Auvergne at ASM Experience, in one of the sport’s temples: Stade Marcel Michelin. Rendez-Vous du Carnet de Voyage, Europavox, the short film festival, the international festival of extraordinary textiles (FITE) and Effervescences are other unmissable events in the calendar of the city on its way to being European Capital of Culture in 2028. 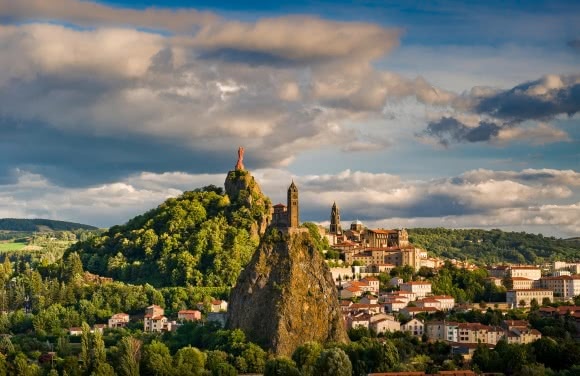 With a little Italian zest and a hint of the Renaissance along its sun-dappled narrow streets lined with sumptuous townhouses, Le Puy-en-Velay combines rich and varied influences and heritage which have given it a strong identity that is both fascinating and endearing. It is an exceptional destination, preserved against the passing of time, and a town full of surprises for its many visitors. 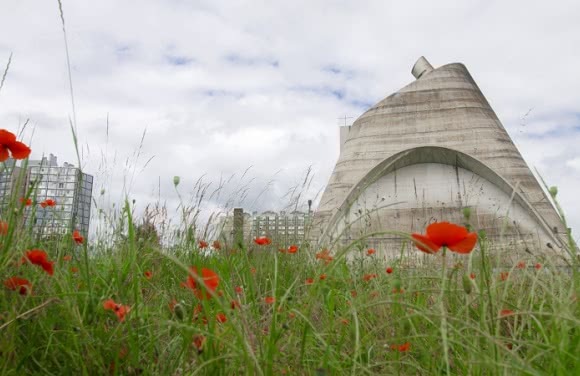 This pilgrimage site is also the point of departure for the Via Podiensis, one of the four main routes leading to Santiago de Compostela. In 1998, Notre-Dame-du-Puy cathedral, Hôtel Dieu, and seven segments along the trail between Le Puy-en-Velay and Ostabat were awarded UNESCO World Heritage status. 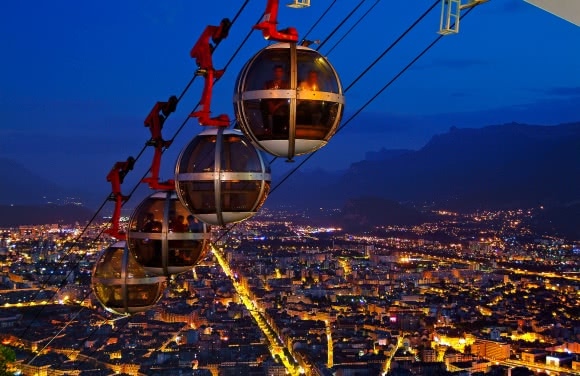 Grenoble lies at the heart of the Alps, a unique destination. Here you can succumb to the pleasure of strolling between mountainscape and city space. As you wander aimlessly from street to street, through squares and gardens, the city’s townhouses and street art frescoes will surprise you at every turn. Its museums will beckon you in. 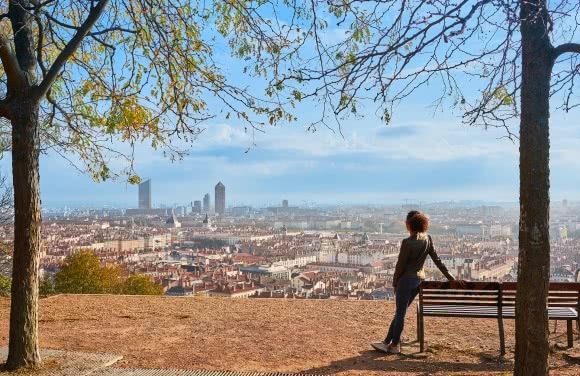 Climb to La Bastille in a gondola lift, on foot or by bike, taking time out to enjoy a drink on a terrace or to sample Dauphinois cuisine, which is making a comeback in many of the city’s restaurants. An air of mystery and a delight to discover! Treat yourself to a stroll through the “traboules” of an ancient and colourful town centre, which basks in the close bond it shares with neighbouring Italy. For six centuries, Chambéry and Savoie, Turin and the Piedmont all fell under the authority of the House of Savoy. 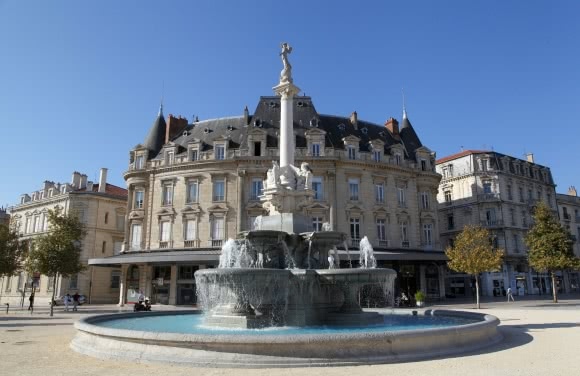 As a visitor here, you will come across Turin-style porticos and Italian trompe-l’oeil features, as well as Place des Eléphants, the town’s symbol, built in homage to General de Boigne who, having returned with glory and fortune from the East Indies, was a benefactor for Chambéry. The Musée des Beaux-Arts boasts a prestigious collection of Italian paintings from the 14th to the 18th centuries. You may also wish to make time for the Maison des Charmettes, a country manor where Rousseau stayed with Madame de Warens. 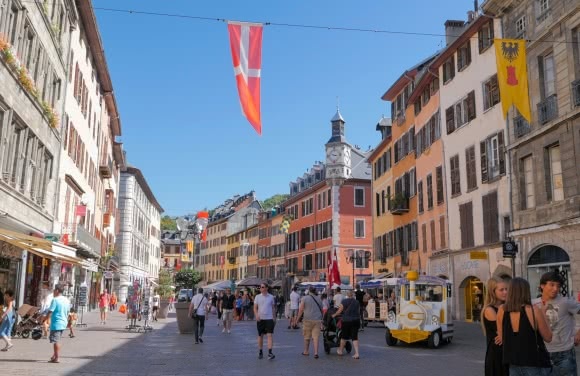 Annecy is internationally renowned for the beauty of its harmonious landscape as well as the quality of the water in its lake which, thanks to conservation efforts spanning more than 50 years, is now Europe’s purest lake. Against this backdrop, outdoors enthusiasts can make the most of a wide range of year-round sports activities on the lake, in the air and in the surrounding mountains. If it’s culture and heritage you’re after, you won’t be disappointed. 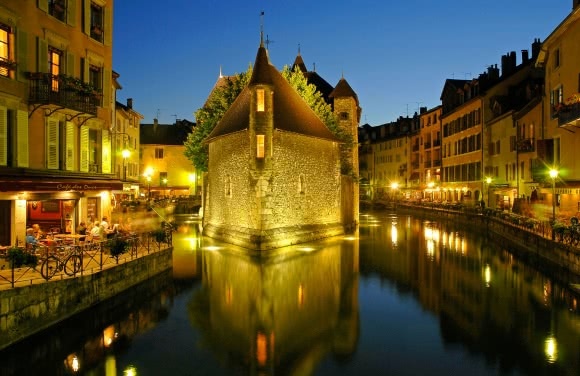 The area has a rich and attractive history, and the agglomeration of Annecy has been awarded the much sought-after “Art an History” label. The pure, clear waters of the lake flow into flower-lined canals that run through the old town (historic centre of Annecy), making it delightfully picturesque and earning it a description as the Venice of the Alps. With its pedestrianised streets and shaded squares lined with inviting terraces and colourful markets, Valence has managed to retain its charm from days gone by. Strolling in the streets, you can admire Saint-Apollinaire Cathedral, the statues and mouldings that cover the facade of the Maison des Têtes, and the city’s most famous monument, Kiosque Peynet, the symbol of lovers. In the open air, succumb to the charm of Parc Jouvet, located at the heart of the city. Valence is also home to the Musée Art et Archéologie and the Centre du Patrimoine Arménien; the city’s “Town of Art and History” status is fully deserved.